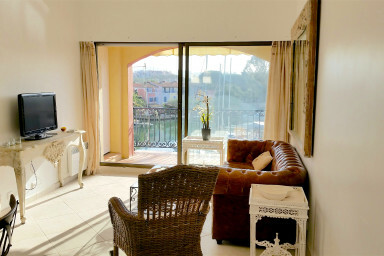 Lovely three-room apartment on the main place of Port-Grimaud south, next to the shops. It is located in a building with a lift, which is very rare in Port-Grimaud. It is entirely renewed and is composed of a living-room with a well-furnished open-plan kitchen (washing machine, dishwasher...), two bedrooms with a large bed and a modern shower-room. There is a large balcony that can be reached through the living-room and the bedroom and has a wonderful view on the canal and the hills.